Obituary – Owens, Imojean Elise « Perry High School Alumni Association, Inc.
﻿Red Hots ’60-’63, Red Hots Co-Drill Leader ’61-’62, Red Hots President ’62’63, Honor Society ’61-’62, English Assembly ’60-’61, Spanish Assembly ’60-’61, Annual Staff ’60-’63, Annual Editor ’62-’63, Annual Queen ’61-’62, F.T.A. ’60-’62, Homeroom Secretary ’60-’61, Homeroom Treasurer ’61-’62, Junior Play ’61-’62, All School Revue ’61-’62, Christmas Vespers ’60-’62, Student Council ’61-’62, Girls’ Chorus ’60-’62, Perry-scope ’61-’62. Miss Imojean Owens, a 1963 graduate of Perry high school, died at 11 p.m. Tuesday in Perry Memorial hospital following an illness of several years. She would have been 19 next Monday. Miss Owens was the daughter of William N. and Cuba (McMahon) Owens, 717 Sixth street. Her father is employed by an oil company. The family moved here in 1953 from Graham, Okla.
Miss Owens was born Sept. 14, 1945, in Modesto, Calif. 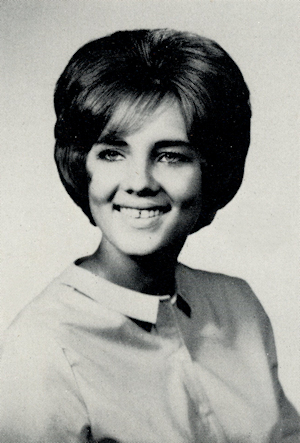 While at Perry high school she was a member of the National Honor society, editor and queen of the 1962-63 school annual, president of the Red Hots pep club and a member of the Future Teachers of America. She was a member of the Church of Christ. In addition to her parents of the home, survivors include two sisters, Mrs. Jack Andrews and Mrs. Allen Henke, Perry; her grandparents, Mr. and Mrs. W. N. McMahan, Ardmore; five nieces and a nephew. Funeral services will be at 2:30 p.m. Friday in the Church of Christ. Jeff Stafford of Nacogdoches, Texas, former minister of the Perry church, will officiate at last rites. Burial will be in Grace Hill cemetery under direction of Newton funeral home. Pall bearers will be Richard Norman, Fred Rosser, James Smith, Herbert Webb, Billy Paul Parker and Ted Jerome.